Since Drury Oils was set up 12 years ago, the company has grown into a stronghold business in the Roscommon town of Ballaghaderreen writes Irish correspondent Aine Faherty. Its formula is arguably a simple one – an independent, authorised Texaco Oil distributor providing a top of the range oil service along with ancillary products that complement the business perfectly. When owner Adrian Drury started the business in 2002, a skeleton staff operated from a small yard with just two 40 foot storage tanks. Adrian drove the company’s sole delivery truck and took orders out on the road whilst wife Fiona looked after the administration. As the business grew Adrian employed additional staff and a new depot was built with storage capacity for 110,000 litres of kerosene, 75,000 litres of gas oil, 75,000 litres of derv and two 70,000 underground petrol storage tanks. Today the company operates a pump service for road diesel, petrol and kerosene, which is sold in 20 litre drums. “This is an important arm of the business which has grown over the last few years,” said Adrian. “We also sell solid fuel in the form of coal and briquettes which has proved to be a good addition.” The Drury Oils forecourt does not have a convenience store. “Our location in an industrial park doesn’t have the passing trade to allow for it,” explained Adrian. The company also sells fully bunded and single skin Platinum Tanks and tank locks – a big seller in recessionary times. “Customers want locks as a deterrent to a would-be thief,” says Adrian. Drury Oils also stocks a range of lubes and engine oils. Although depot sales are important, the company’s home heating delivery service accounts for most of the business. Over the winter months and at other busy times, Drury Oils operates four delivery trucks – one that Adrian drives, another driven by a full-time operator and two others with seasonal drivers behind the wheel. “This market is still buoyant, but the commercial side isn’t as big as it once was,” said Adrian. “I pulled away from filling stations when an increasingly dodgier element began creeping in. I’m holding my own in these challenging times and still have good customers and a strong pool of suppliers. “I would advise anyone in the distributor market to ensure that they get paid for product. We should all be talking to each other, and we should make sure that if we’re owed a lot of money, we tell others about it so they don’t get their fingers burned too. “I also think distributors should have a minimum delivery – one that they can actually make money on, and stick to it,” added Adrian. “For me a drop of €150 is only feasible in the local town – it wouldn’t be worth travelling 10 miles for a drop of that size. In the summer months, Drury focuses on a strong agricultural market where it has a number of loyal, local customers, and despite the slowdown in the sector, the company has a select band of hauliers that remain on its books. Marketing and promotional plans are also put in place – marketing the Drury Oils brand and product both locally and online is never underestimated. “We’ve recently invested in freshening up our website, the revamped site now has a very modern feel and is easily navigable,” explains Adrian. Having tried to grow the business further in bad times, when conditions are better and the time is right, this amicable businessman wants to steer his business in an upward direction once again. 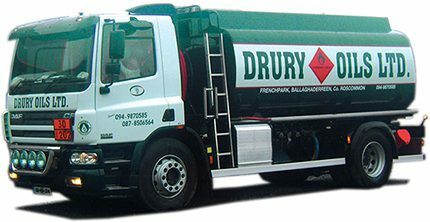 County Roscommon distributor Drury Oils is calling for distributors to have a minimum delivery – one that actually makes money!